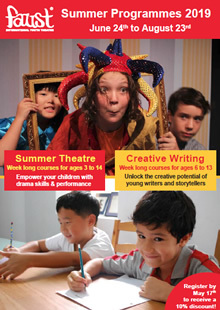 Faust’s Summer Theatre and Creative Writing programmes are now open for registration! Join us for an action-packed Summer full of drama, creativity and plenty of fun! Register by May 17th to enjoy a 10% early bird discount on all registrations. Faust’s highly sought-after Summer Programmes in both Theatre and Creative Writing are back for its twentieth season of dramatic fun and storytelling! Our week long Theatre and Creative Writing programmes aim to provide a fun-filled learning environment for children to develop self-confidence and teamwork, while fostering a respectful environment in which participating students learn from each other’s experiences. Register your child by May 17th to enjoy a 10% early bird discount on all registrations fees! Click on the links below to view our programme brochure and our full schedule! Our Summer Theatre workshops run either in the morning from 10:00am to 12:30pm, or in the afternoon from 2:00pm to 4:30pm for ages 3 through to 14 (different age groups are available at different times). 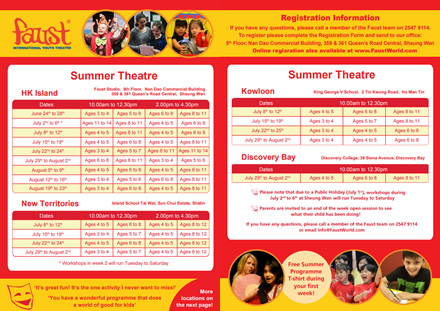 Workshops take place in Sheung Wan, Kowloon, Tai Wai and Discovery Bay. Each week, under the careful guidance of our leaders, children explore a different drama theme, play or topic. Workshops are tailored to the needs and age of the children and new content is created each week so that children can do multiple courses! The week starts with ice-breaking activities helping the children to become comfortable in their new environment, allowing them to get to know each other and encouraging them to be proactive and supportive. The workshops then focus on development of performance skills such as improvisation, devising, clarity of expression, vocal projection, movement or script work. Parents are kept informed about what the group has been doing by a mid week email outlining workshop content, as well as being invited to the end of week open session. Our Creative Writing workshops run either in the morning from 10:00am to 12 noon, or in the afternoon from 2:00pm to 4:00pm. Workshops are suitable for ages 6 through to 13 (with groups divided according to age), take place in Sheung Wan and Tai Wai. Each week, under the careful instruction of our experienced creative writing teachers, children look at different aspects of creative writing including metaphors, similes, dialogue, poetry, descriptive techniques and genre writing, to list but a few. Whether a student is an aspiring writer or a novice, our students will have plenty to write about! Our limited class size (maximum of 8 students) allows plenty of time for discussion, as well as group and individual feedback. At the end of the lesson we review what we have done and share what we have learnt and how we will apply this in our writing. Please note these courses are designed for children with native or a high level of fluency in English, and are not designed as an English as a Second Language programme. To reserve your child’s place in our Summer programme, please click here to complete our online registration form. For current or previous Faust members, you can complete the express registration form here. You can also complete the registration form in the last page of our programme brochure and return it to our office. Click here to view the programme brochure. If you have any questions about our Summer Programme, please contact us at Info@FaustWorld.com or call us at 2574 9114.